In the past, my winter recipes have been all about sweet potatoes (don’t worry, I still love sweet potatoes.) However, I’ve been completely enamored with root vegetables this season. Celeriac, parsnips, turnips, and rutabagas have been on the top of my list (I’m currently loving rutabagas, lots of rutabagas!) It would seem that a lot of the root vegetable recipes are a simple mash, so I’ve been working on recipes to get out of the “mashed root vegetable” rut. Turnips have such great consistency when grilled or roasted, plus a light sweetness one wouldn’t necessarily expect from root vegetables. This dish is a great lunch or an easy dinner to throw together. Serve over quinoa for an extra added bit of protein or include a handful of white beans. Also, if you grab a bunch of turnips that have greens still attached- wilt them in a bit of heated olive oil and add to the dish before serving! Preheat oven to 375˚. 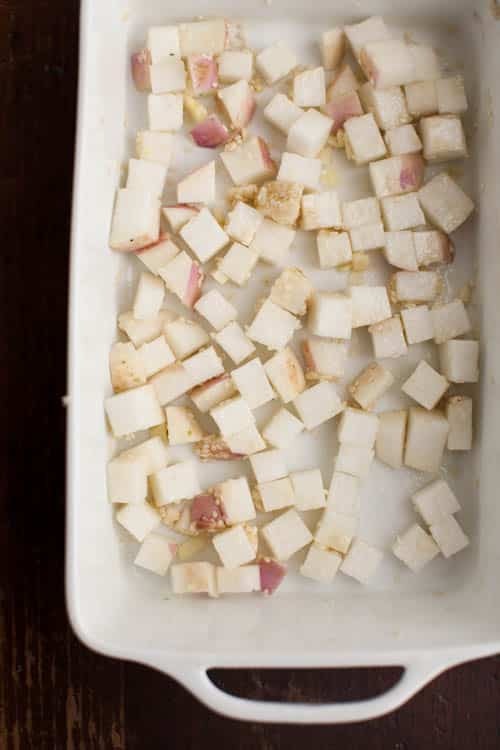 Cut turnips into ¼” cubes and place in a bowl. Add minced garlic, olive oil, sesame seeds, honey, and sea salt: toss until well combined. Spread turnips out into a single layer in a roasting pan and bake for 25-30 minutes until caramelizing and turnips are tender. Remove turnips from oven and add the soy sauce and cilantro to the roasting pan. 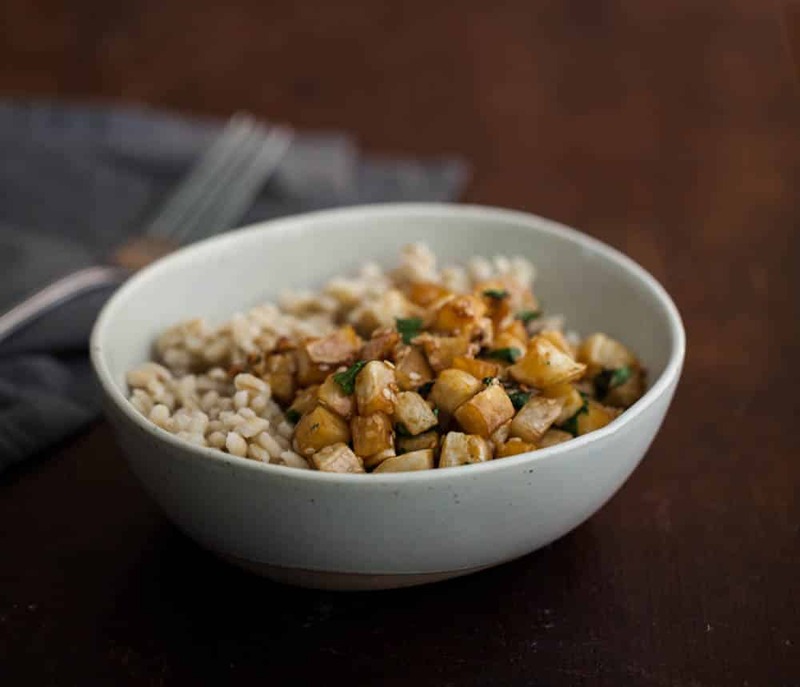 Serve turnips over cooked barley. Beautiful way to prepare turnips! Looks delicious. 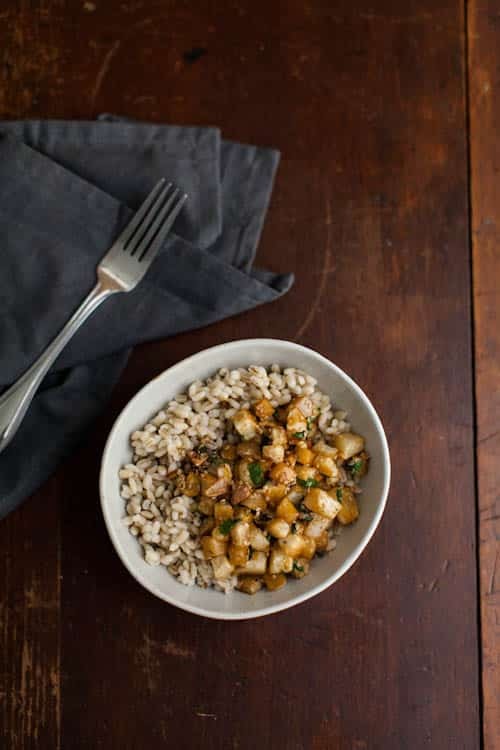 I love that you’re featuring root vegetables, and this combination of barley and roots is awesome. Roots don’t get enough love in my opinion. It seems like we’re complaining in the cold months that there is not enough fresh produce but I think the root vegetables, citrus, and tropical fruits make it plentiful! I’ve been on quite the rutabaga kick as well and have at least one really great recipe on the horizon. I haven’t done much with turnips this season, though! FOR SHAME. I’m loving this sesame twist. Eating a whole bowl-full would make me quite happy. This really looks good, love the flavor combination! I definitely tend to stick to sweet potatoes in the winter but it’s great when you can branch out and try something new. Right now I’m stuck on acorn squash (yum.) so I can’t wait to try this with turnips. I’m not sure if I’ve ever had a turnip! Pinned. You just take the prettiest rustic pictures and make me so excited to garden! I haven’t had turnips since I was very little, I’m guessing I didn’t like them seeing as i haven’t had them since. This sounds like a great opportunity to give them another go! Lily, I found, many years ago, that I’d disliked something from my childhood, not because I didn’t like it, but because I thought it was something else. After I was married, I had a chance to try it again, at a family gathering, when all these farm boys were digging in with gusto! I tried it again and did like it. I just had a prejudice against it., now long gone. Mmmmm . 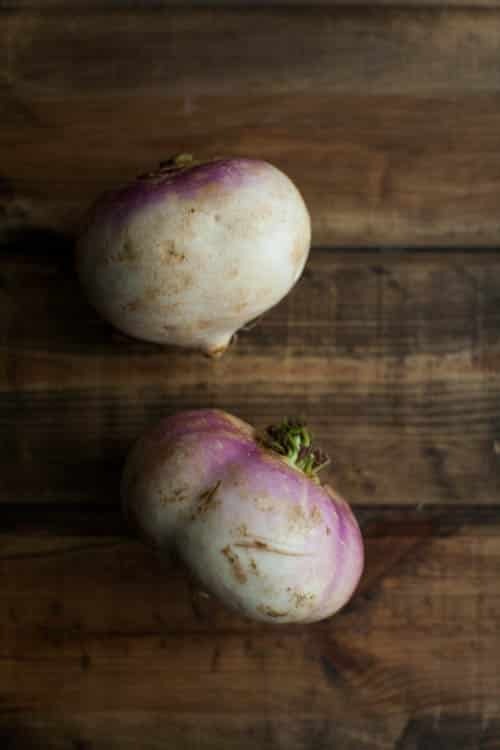 . . I’ve been looking for a turnip recipe:) Sounds delicious and full of healthy goodness!! Ella, you may have opened a Pandora’s Box, admitting to want to try different rutabaga recipes. I do love it mashed, but I have dozens of recipes that I’ve tried, one is so wonderful, I must have it at least at Thanksgiving, or maybe Christmas. It’s a scalloped rutabaga, rutabaga slices, blanched, layered with an equal amount of apple slices, a generous pinch of brown sugar, a generous grating of nutmeg, and some small bits of butter, using heavy cream or apple cider/juice as the liquid. HEAVEN! It NEEDS the brown sugar, but not a lot. I prefer it in place of potatoes of any kind. 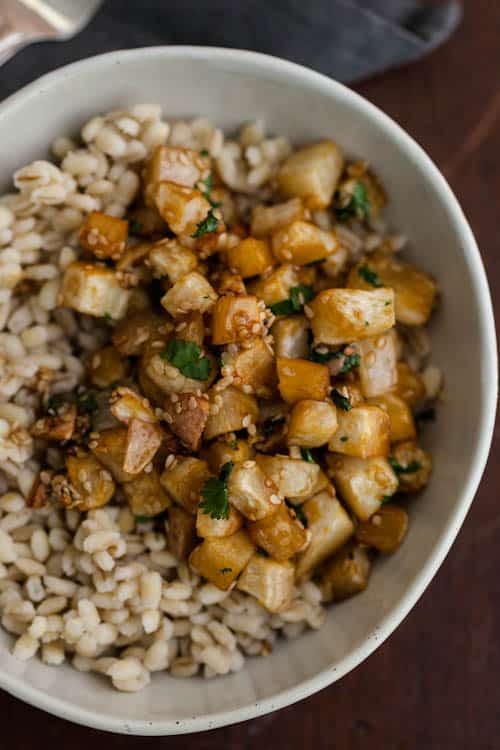 Your posted recipe, with sesame seeds, gives me an idea to try my scalloped rutabaga with a small drizzle of sesame oil, or garnished with toasted sesame seeds. I may just have to go make some for my Sunday dinner! I just made these tonight, it was so yummy! 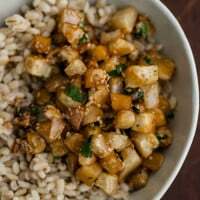 Im a longtime turnip lover but was looking for a new way to prepare them. this reciep adds a savory flavor that really compliments the earthy taste of the root. I found this recipe via buzzfeed. Not always crazy about turnips, but grew lots of turnips and rutabagas cause they keep well and loved them prepared this way! I made this today and it was so delicious!